Our Pan Merseyside Child Exploitation Service, commissioned by Merseyside PCC, works across five boroughs and with five Local Authorities. The team work with Sefton Council has been nominated for a Children and Young People Now award. Kara Haskayne, Service Manager of the Independent Safeguarding Children and Quality Assurance Service at Sefton Council, blogs about why the partnership works so well. Partnership working ensures we wrap support around a child, and makes sure they have the support that they and their family need. It’s fundamental we work together, to address Child Exploitation risks and protect children from being abused. Across Sefton we have a wide range of partnership support, and don’t have a hierarchy in those services – we see all our partners as equals. Our work with Catch22 has been central to our Child Exploitation Partnership Pathway. Often children and young people who are being groomed are told to not trust Police or Social Services. Catch22 are not seen as a statutory service and have the ability to engage with young people who didn’t previously perceive themselves as being exploited. Our Catch22 colleagues have really helped us gain an insight into children’s daily lived experiences and the exploitation that abusers have tried to engage them in. This helped us put an effective and robust partnership Child Exploitation Multi Agency (MACE) Plan in place, to protect children and young people and prosecute those who are abusing them. Ellie and the team have worked with Sefton’s Safeguarding Lead, Merseyside Police’s Sefton CE team and Sefton’s Community Safety Lead, to raise awareness across the whole partnership of the signs of exploitation. This training means we now have the eyes and ears of all professionals and all services working within communities to spot signs of child exploitation at earliest opportunity. Together we’re creating a ‘zero tolerance’ culture across Sefton, it’s clear that we won’t tolerate our children and young people being exploited. The stand out moments for me are when our children and young people tell us how their Catch22 Key Worker has really helped them to understand they’ve been exploited and helped them to feel safe. When they have accepted their support we see improvements in children’s individual lives, in terms of attending education, a stronger sense of well-being and self-esteem, developing positive aspirations for their future and regain positive protective relationships with their family, peers and local networks. All of this helps protect our children and young people from any future exploitation risks. 1, Work together to build an offer that meets local need: The charity needs to be clear about their offer and the commissioner needs to think about how their commissioning arrangements facilitate partnerships. Commissioners should listen to third sector voices and children’s feedback, allowing them to influence service design so we can offer the best service to our children and young people as possible. 2, Make partners feel valued: Ensuring that partnership organisations like Catch22 feel valued for the contribution they bring and are treated as an equals. This is vital to keep relationships strong across the partnership. 3, Promote co-locating and co-working: If possible, partners should offer an office space for charities to work in so they can be based with statutory services. This enables positive and fast communication and information sharing, and the team are literally sat next to the other workers that are in the child’s life. For me, partnership working means to ensuring all agencies can use their expertise to achieve the best outcomes for young people. 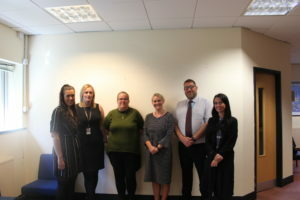 Partnership work has opened doors for Catch22 to provide educational awareness to professionals, and also facilitated our introduction to young people’s lives through joint visits. By trusting and encouraging our support, Sefton Council enables us to spend their time where it really counts- building a trusted relationships with young people. For me, some of the highlights have been our multi-agency work in Sefton being shortlisted for two national awards, and supporting Sefton to receive recognition from Ofsted. But more than anything, it’s amazing to see the impact we have every day as we work together to safeguard children from exploitation. Get in touch with Pan Merseyside CE service here.